The night's most visceral moment comes when Foals launch into the one tune that, just a few years ago, would have been inconceivable as a song penned by them. 'Inhaler' always sounded heavy on their 2013 record, Holy Fire; live, it takes on a thundering, primal life of its own. Alexandra Palace isn't renowned as London's best Victorian pile to achieve the oomphiest sound – but tonight is different. 'Inhaler''s positively Rage-filled chorus is souped up by a colossal sound-system, hitting like a buffalo herd. Riding the awesome wattage and chaotic waves of banging heads beneath him, frontman Yannis Philippakis – and thousands of others – shriek "I CAN’T GET ENOUGH SPACE". Clearly, this is a band with some new-found muscle. As the storm continues to howl outside, Philippakis promises us a "savage Valentine’s Day" – he's spot on. Foals deliver a seriously strong night – the first of two sold-out shows and a worthy round-off to their UK tour – underscoring the band’s remarkable transformation. And while the gig is perhaps more competent than dazzlingly spontaneous, you've got to hand it to them – their evolution from precocious, math-rock boys from Oxford to a band who can hold sway over a 10,000-strong arena looks impressive. The songs from Holy Fire are some of the best to hear live. The show begins well with their smouldering, atmospheric album opener 'Prelude', which rolls into a heavy, psychedelic shuffle complemented by a storm of strobes, lights and lasers. Up next is the delightfully jangly 'Hummer' and the old favourite, 'Olympic Airways' – followed by last year's infectious single, 'My Number'. It's shameless, it's ebullient, and the sunny guitar licks of Jimmy Smith do the job every time. Philippakis's voice is impeccable during 'Milk & Black Spiders', which resonate beautifully throughout the cavernous venue. But the more memorable moments come when Foals shook off their spindly, former selves to unleash something with a bit more power, namely the delirious climax of 'Providence'. The rowdy, pre-encore closer of 'Inhaler' rounds of the set perfectly before the band return with 'The French Open' (they've had enough years to do so, sure, but they absolutely nail the tune's complex polyrhythms) and 'Two Steps, Twice' – five minutes of adolescent, day-glo excitement but a fine tune on which to bow out. 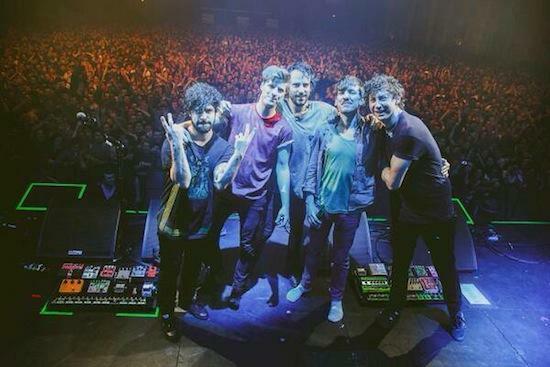 Since they began the slog around the world to promote Holy Fire, Foals have been praised for the energy of their live shows. But tonight it seems that there's some way to go till they really fulfill the (perhaps meaningless) tag of "Britain's best live band" that has been bandied around recently. More spontaneity wouldn't go amiss, neither would Philippakis reconnecting with his boisterous hyperactivity which made him such a good frontman in the early days. OK, he went through the motions of casually clambering up a speaker stack halfway through the show before hopping down soon afterwards – but it was forgettably nonchalant. Has the Foals live experience lost something in moving from smaller venue to stadium stardom? Admittedly, I was left with that lingering feeling. But 2013 was a watershed year for them, a transition to the big league. And, mostly, they've taken it in their stride, with strong new material and reinvigorated classics. What's nicest to see is that the band are clearly relishing it and take nothing for granted - "Thank you for your love," a moved Philippakis says halfway through. He later adds: "I can remember the first time we played here. We were supporting Bloc Party. We were knock-kneed and we were scared – and there was nobody here." Clearly much has changed since that winter night six years ago.